The front men for the austerity agenda are back with plans to cut Social Security and redistribute wealth upward. 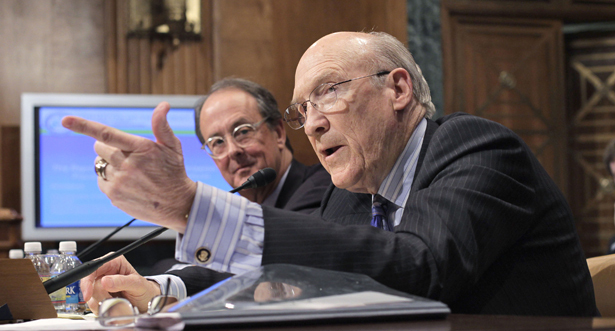 Cue the return of Alan Simpson and Erskine Bowles, frontmen for American austerity. If sequestration is not averted by the end of the month, America will experience an arbitrary austerity agenda that shifts burdens from the wealthy onto working families. It makes across-the-board cuts to vital services. As President Obama noted Tuesday, sequestration would impose “automatic brutal spending cuts” to job creation, infrastructure and education initiatives. It would, as well, slash funding for air traffic control, federal prosecutions and Federal Emergency Management Agency grants that make it possible for states and local governments to hire needed firefighter and emergency personnel. Even the parts of the sequester that are appealing—squeezing the bloated Department of Defense budget—will tend to harm low-wage federal employees rather than billionaire defense contractors. By any measure, the sequester is austerity. But it’s not enough austerity for Simpson and Bowles. The former Republican senator and defeated Democratic senate candidate who praises Paul Ryan’s budget don’t particularly like the death-by-slow-cuts of sequestration. They prefer a full frontal assault on the most vulnerable Americans and a redistribution of the wealth upward. As President Obama has noted, Washington has already reduced the deficit by $2.5 trillion. But the co-chairs of the failed National Commission on Fiscal Responsibility and Reform now want another $2.4 trillion. To wit, in a “rehashed” plan to “Fix the Debt,” Simpson and Bowles are busy promoting schemes to “modernize…entitlement programs to account for” an aging population. That’s code for schemes to delay the point at which the hardest working Americans can get access to Social Security and Medicare. Ellison is right. As is invariably the case with austerity schemes, Simpson and Bowles—and the billionaire-funded “Fix the Debt” group they head—are proposing cuts to the top marginal tax rate for wealthy individuals and corporations. The United States can and should address debts and deficits. And there are sound plans to do so, including the “Balancing Act” advanced by Ellison and other members of the Congressional Progressive Caucus. That initiative rejects austerity and proposes a growth agenda based on tax fairness and investments in education and job creation. That’s not Simpson-Bowles, which Nobel Prize–winning economist Paul Krugman dismisses as “terrible” economics. That’s responsible policy that avoids the “brutal cuts” of sequestration and the even more brutal cuts of full-fledged austerity. Meanwhile, Greg Kaufmann writes, the Temporary Assistance for Needy Families program, or TANF, languishes.